One of Europe’s best preserved medieval fishing structures located on the Fergus Estuary in County Clare, Ireland, will be washed away by tidal flows before archaeologists can reveal its secrets. A team of University College Dublin archaeologists who have been visiting the remote 700 year old fishing site will no longer be able to conduct their scientific recording and analysis, due to recent budget cuts experienced by the Irish Heritage Council. 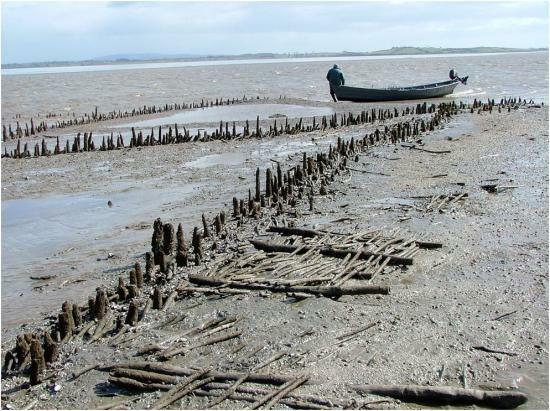 “There is little we can do to preserve the medieval fishing structures because they are totally exposed to the forces of nature on the mudflats, after being buried for centuries beneath the mud,” explains Dr Aidan O’Sullivan, UCD School of Archaeology, University College Dublin. Located about 1.5km from the nearest dryland in the Fergus Estuary in County Clare, Ireland, the medieval fishweirs [wooden structures] are in the very middle of a vast landscape of mudbanks and water channels. The archaeological site can only be accessed by boat for a few short weeks in the summer when the tide is extremely low. “The mudflats are too deep and dangerous to walk on,” says Dr O’Sullivan. “Even when we can see them at low tide, we only have about 2 to 3 hours at most to examine them,” he explains. The wooden fishweirs are long wooden fences of upright posts interwoven with wattle that converge in a V-shape on the estuary mudflats close to the low water mark. “We can see wooden ropes with knots tying together the structure and most remarkably, we have even found woven, conical baskets intact in the clays at the ends of the weirs. It is almost as if someone had walked off and left these baskets there last year,” says Dr O’Sullivan. In the Middle-Ages, any fish dropping down with the ebbing tide would have encountered these fences and would have been guided into the end of the weir, where they would have been trapped by baskets and nets. “Medieval fishermen would have travelled out here by boat at low tide to build and repair the weirs and to remove the catch every day,” says Dr O’Sullivan.